There’s something quite romantic and charming about London’s skyline. Striking and inspiring, it certainly gives off that feeling of possibility and adventure, perfect sentiments on your wedding day! If you’re a perfectionist and a sucker for quality and precision, you’ll utterly appreciate this design from Five Dollar Shake Weddings because there isn’t a line or a Swarovski out of place, everything is faultless! 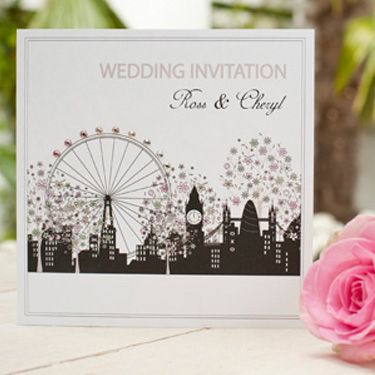 Whether you call this inspiring city home or you were lucky enough to get engaged here, this range of wedding stationery will make a superb addition to your wedding day. The largely black and white design works really well to achieve that ‘night time’ feel of the city. Silhouettes of famous and iconic landmarks have been beautifully and seamlessly printed on 300gsm board. Three stunning trees have been modestly placed behind the London Eye, the Gherkin, Big Ben and Tower Bridge, but despite this, their beauty doesn’t go unnoticed. If you look closely you can see the delicate and intricate pink and green flowers that adorn the branches. It’s a lovely contrast from the dark, almost masculine skyline – best of both worlds! To add another dimension (and glamour! ), the London Eye has been embellished with nine gorgeous Swarovski diamantes. Eye catching and totally unique, the Park Lane illustration of our much-loved capital will certainly receive lots of compliments from your guests! With some of the most famous landmarks of ‘The Smoke’ skyline as a backdrop, and making particular use of the London Eye, this collection is perfect for those who call our nation’s capital ‘Home’. Boldly printed onto a gorgeous brocade effect board, with Swarovski diamantes matched to your wedding colour scheme.